I talked about use of high-throughput DNA sequencing to improve fertility by removing DNA variants from a breed that cause embryonic losses during pregnancy. Here is a link (Managing Broken Genes in the Age of Genomics) to the PowerPoint presentation I gave. I discussed the development of a genomic EPD based on the number of embryonic lethal variants (broken genes) that an animal carries that causes losses of embryos during pregnancy. 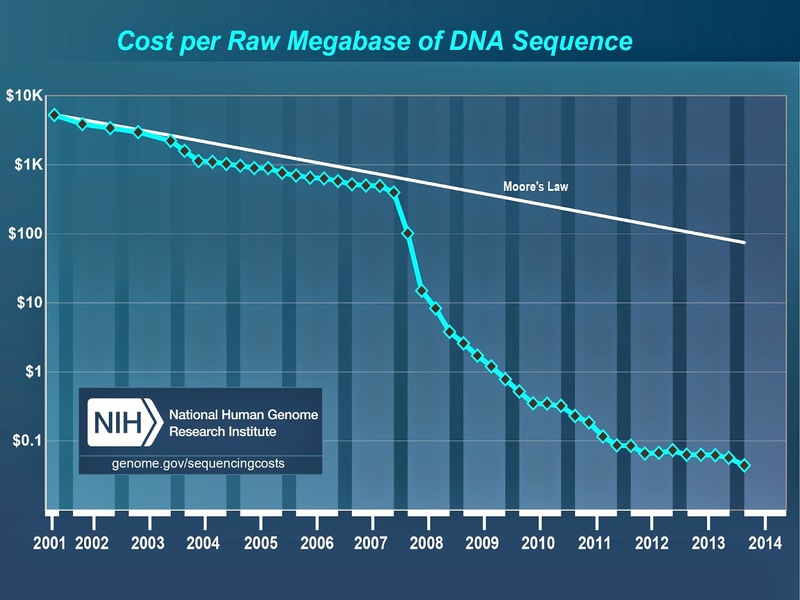 The cost of DNA sequencing has rapidly dropped in the last 15 years. In 2001 it cost about $10,000 to sequence a million base pairs of DNA. In 2014 it costs under 10 cents to sequence a million base pairs. This rapid drop in the price of DNA sequencing has enabled researchers to tackle questions that we previously could not address. With this sequencing data we are identifying loss-of-function variants (broken genes) that lead to pregnacy losses based on the sequences of approximately 200 bulls. Dorian Garrick discussed the development of genomic-enhanced EPDs for the American International Charolais Association. First, Garrick discussed in beef breeding we seek to move the cloud of performance data. He gave an example of the relationship between birth weight and weaning weight. Animals that have high weaning weights tend to have high birth weights and animals with low weaning weights tend to have low birth weights, but some animals have high weaning weights and low birth weights and vice versa. We can select parents from any portion of this cloud to move the breed average. We can select which parents to use by looking at the distribution of their offspring's performance. Typically we think good bulls produce good calves and bad bulls produce poor performing calves. But, a good bull with produce a range of offspring that range from really good to average to poor. The genetic merit (breeding value or EPD) of a bull is based on the average performance of his progeny. For bulls and females within a breed we have different amounts and reliability of performance information. We account for the differences in the amount of information on an animal using a statistical procedure called BLUP (Best Linear Unbiased Prediction). The EPDs predicted by BLUP predict the average genetic merit of that animals offspring. But, we can also think of EPDs as the sum of the effects of all of the gene variants that animal carries. You can think of this as the portfolio of the gene variant effects an animal carries. The goal of genomic prediction to genomically-enhanced EPDs (make them more reliable) is to test an animals DNA to sum up the effects of the genes it carries. Garrick discussed retraining of the Hereford genomic predictions. By going from about 3,000 animals to 10,000 animals the amount of variation explained increased from about 30% to 45% on average for each trait. Garrick also discussed that predictions do not work well across breeds when the target breed is not in the training data. This is due to different strings of variants inherited as a unit, called haplotypes, present in different breeds. When genomic predictions do function well across breeds it is because there are haplotypes of large effect that are shared across breeds. Creation of a genomic-enhanced EPD for Charolais is currently underway at Iowa State by Dorian Garrick's group. There have been several issues with matching up the genotypes with the trait measurements, but these issues are being resolved. Once genomic prediction equations are estimated, GeneSeek will process genotypes and calculate genomic prediction for tested animals. Angus Genetics Inc. will then use these genomic predictions as a correlated trait to improve the reliability (accuracy) of the estimated EPDs. The boost in accuracy is highest for young animals with very little information. Leaders within the Charolais breed continue to work for the best strategy to generate additional genotype and trait data moving forward.